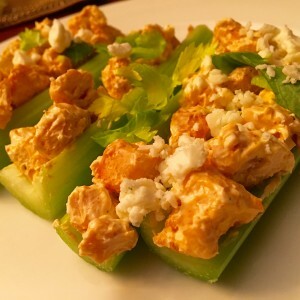 Buffalo Chicken Celery Sticks! Less mess, less calories, everything in one bite! One of the most popular dishes at any Super Bowl party is chicken wings. Serve up this lighted up boneless version to keep you and your friends happy and sticking to their goals this year! Less mess, less clean up, and no bright orange fingers to stain your sofa. These are super simple. Just use cooked chicken or turkey (chopped, ground, or shredded) a rotisserie chicken is great for this and there is no cooking involved. Just make sure the pieces are small enough to sit on the celery sticks. Mix the chicken with some, wing sauce (no butter) and some low fat or fat free cream cheese. The less cream cheese the hotter they will be, so adjust accordingly. Fill the celery sticks with the chicken mixture and top with crumbled blue cheese and the celery leaves. You can serve some blue cheese dressing or ranch on the side and maybe some extra hot sauce for those that like it spicy.